Easter offers a brilliant opportunity for businesses to engage their customers in some Springtime (and chocolatey!) fun. It’s eagerly anticipated by everyone, from schoolchildren to workers looking forward to their first long weekend of the year. In 2019, Easter falls on the 21st April. 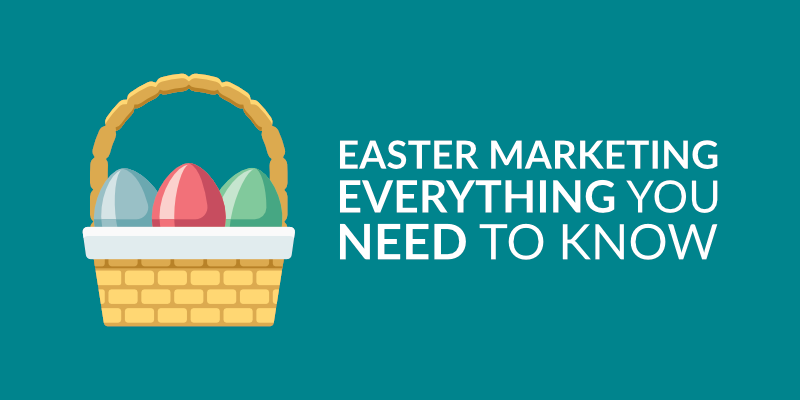 However, the date changes every year, so it’s worth keeping on top of when Easter is and planning your marketing activities well in advance. The reason why Easter falls on a different date each year is because it’s based on a combination of the seven-day week and the cycles of the Moon. Easter Sunday is calculated from the first Sunday after the full moon following the Spring equinox in March. The decision on when Easter should fall each year was made way back in 325 AD by the first major church council, called the Council of Nicaea. Easter is celebrated in many countries across the world, however, it may occur at different times. Easter churches (Greek and Slavic) and Oriental churches use a different calendar system to European churches. Easter is only celebrated on the same day worldwide when the two different calendars align – something that won’t happen again until 2034. Therefore, if you’re planning an international campaign, double-check your timings. Religious festivities aside, globally there are many traditions to get adults and children excited. In India, there are elaborate celebrations involving carnivals, street plays, dancing and gifts of chocolates and flowers. In France, children are gifted treats from the Easter bells. In Poland, families prepare a blessing basket full of coloured eggs, sausages and bread, that is then taken to a church to be blessed. Easter is a Christian holiday that celebrates the resurrection of Jesus Christ. Three days after Christ was crucified, he rose again – an occasion that is marked on Easter Sunday. However, many traditions associated with Easter date back to pre-Christian, pagan times. These include chocolate Easter eggs and games such as egg rolling or egg decorating. It is believed that eggs represent fertility and birth in the pagan tradition. The eggs’ association with Easter may, therefore, be a nod towards Jesus’ resurrection (or re-birth). The roots of the Easter Bunny are less well-known. Some historians believe that the traditional Easter character came into life during the travels of German immigrants to America in the 1700s. Rabbits are notorious for being enthusiastic procreators, so their connection with Easter may also represent new birth and renewal. Finally, the traditional Easter meal of lamb is closely linked to the Jewish tradition of Passover, that occurs around the time of Easter Sunday. Jesus was also known as the “Lamb of God” so the eating of lamb at Easter could represent his sacrifice and death. With such a varied history and many traditions, Easter offers a lot of opportunities for businesses to get involved. Although Easter is known for indulgence in chocolate, there are alternatives for companies with less of a sweet tooth. One of the most obvious ways to take advantage of Easter is to hold a special event. This works particularly well if your target customers are children or families, as kids love to get involved in Easter shenanigans. Plus, the school holidays fall around Easter time, so parents may be grateful for an activity (or two!) that will keep their children occupied for a while. An Easter egg hunt is an egg-cellent, traditional choice. If you have a store, hiding chocolate eggs or egg-shaped tokens around the shop will encourage potential customers to hunt through your aisles and see your products simultaneously. Arts and crafts are also popular. Encourage children to make their own Easter baskets to collect eggs on a hunt, or to make an Easter bonnet. They could do egg decorating as well, either with foam or real (empty) eggs. Alternatively, you could arrange for the Easter Bunny to drop in and meet children. Bookshops could arrange for Mr Bunny to do some storytelling. Restaurants could hold a special lunch with the Easter Bunny. Sports brands shouldn’t rule themselves out of the chocolate-themed fun either. After all, customers may want some eggs-ercise to burn off the extra sugar and calories! An Easter fun run is a good promotion for gyms and sportswear companies. Why not increase the fun by wearing silly Easter bonnets or dressing up as bunnies? Athletes who are up for the challenge could hop around the course. Speaking of food, Easter is practically made for chocolate workshops. Or, you could plan a series of events up until the big day itself – to make Easter eggs for loved ones, for example. But Easter can be savoury as well. Cafes and restaurants can choose from a plethora of egg dishes to serve up on the day. Try cooking a giant ostrich egg as an Easter treat for several customers. Or attempt a world record in the largest fried egg, the most expensive Easter egg or the most people eating egg and soldiers at the same time (currently standing at 178 people). Lamb and rabbit are popular Easter dishes as well. Another option is to celebrate one of the global traditions of Easter, such as creating your own Polish blessing baskets with savoury delicacies. For a more adult twist, you can create chocolate themed cocktails. 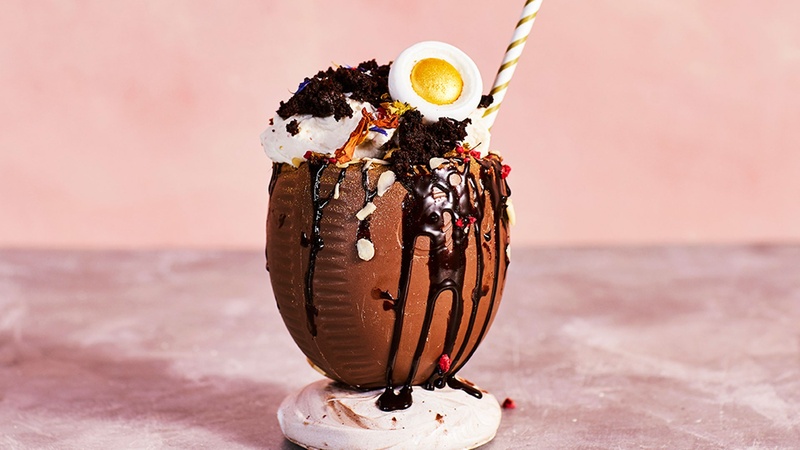 Using Easter eggs as cups for your delicious drinks is another Instagram-friendly option. 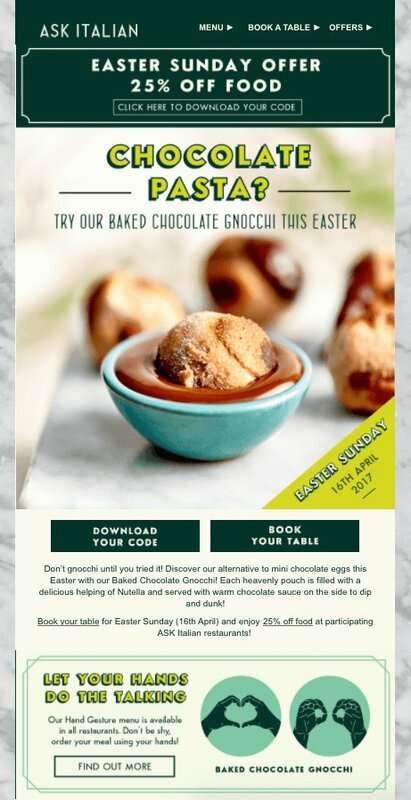 ASK Italian restaurants did a quirky spin on Easter when it developed its own chocolate pasta. Importantly, this stuck to its core brand (being an Italian restaurant) whilst doing something special to mark the occasion. Making it a limited-time offer, created more buzz and appeal around the product. There are many other spins to the traditional egg hunt. Instead of giving out chocolate eggs, you could offer discounts and exclusive products with each egg. You could make it a competition, crowning the customer who finds the most eggs in 30 minutes and offering a prize. If you don’t have a physical space for the event, you can still do a virtual egg hunt. Have people search your website for eggs which pop up at random times as they browse. These eggs could offer coupons or customers could compete to fill a virtual Easter basket. 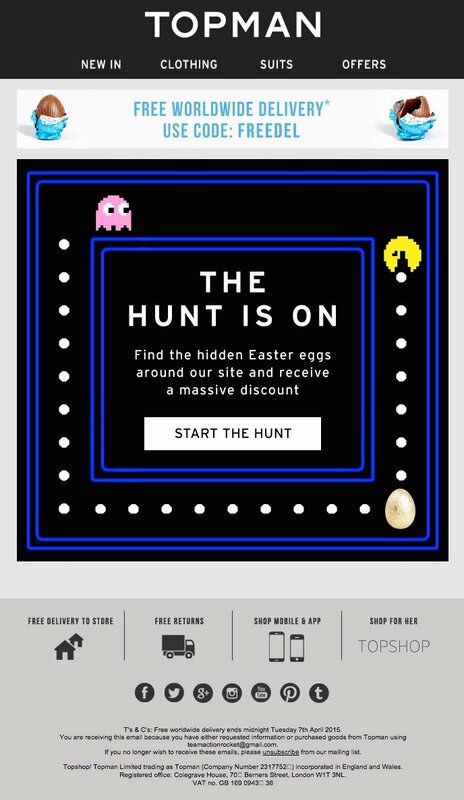 Topman ran a virtual egg hunt on its website, promising a massive discount to lucky egg finders. The promotion tied in closely with Topman’s branding and was made much more appealing to its target audience by using Pacman imagery instead of a fuzzy Easter Bunny. To merge your offline and online worlds, you could use geo-caching to direct customers to specific locations for an egg hunt. This works egg-ceptionally well for local brands who can take advantage of local landmarks. Gift To Nature, an organisation that looks after green spaces on the Isle of Wight, held a geo-caching Easter egg hunt in 2018 to boost visitor numbers. Families were encouraged to use the GPS on their smartphones to navigate to different areas of Brading Down on the Isle of Wight, to find hidden containers at each location. Cadbury’s has a reputation for ambitious Easter marketing stunts. One year, it created a 360-degree Facebook video for a virtual Easter egg hunt. 220,000 eagle-eyed individuals took part in the one hour event. They also posted over 70,000 comments to the brand’s Facebook page, massively boosting its engagement and social media reach. Whilst we’re on the topic, social media is a cracking tool to extend your brand awareness beyond your usual target audience. People will usually engage with Easter themed hashtags and posts on social media, so might be more receptive compared to the rest of the year. However, may brands flock to social media to show off their Easter activities. So you’ll need to do some planning to ensure your posts stand out. Make sure there are images and videos of all your Easter happenings. People will want to see what’s happening and it will increase excitement and a feeling of missing out if they’re not involved. Plus, video and images are incredibly effective on social media. 82% of consumers watch videos on Twitter and businesses that use video have 41% more web traffic compared to ones that don’t. Over half of marketers use a video or image on every social media post. Don’t forget Facebook Live and Instagram Stories. These mediums are usually more on-the-go, so they work perfectly for quick videos of your Easter Sunday action. Because they’re time limited, your customers will feel like they’re getting an insider look at all the fun. But it doesn’t have to start on Easter Sunday. You can post sneak peeks of your preparations during the week to boost engagement and participation for the event. If the Easter Bunny is putting in an appearance, you can show him getting ready for his big day by having a haircut, buying a new suit or preparing his chocolate eggs. If you’re doing an Easter Egg hunt, hint at potential location clues. Other than publicising your own Easter happenings, you can use social media to connect with what your customers are doing. A recipe website could run a competition to discover the best roast lamb dish. A retailer could search for the cutest Easter Sunday outfit. Tapping into the social media community is a good way to generate content that you can re-post on your marketing channels. Make sure you use a specific hashtag and communicate this to all your customers beforehand. If they just use #Easter or #EasterSunday then posts will get lost in the millions of updates that happen on the day. Instead, create a hashtag using your company name or the name of your competition, we might use #AppyEasterSunday for instance. A PR stunt can get you some headlines as well as brand awareness. To get attention, PR stunts usually have to be over-the-top and outlandish. So, you’ll need a relatively big budget to pull one off. You could do an Easter Bunny flash mob in your town centre, for example, or create a life-sized chocolate local landmark. Carlsberg ran an Easter campaign that tied in with their ‘If Carlsberg Did’ slogan. 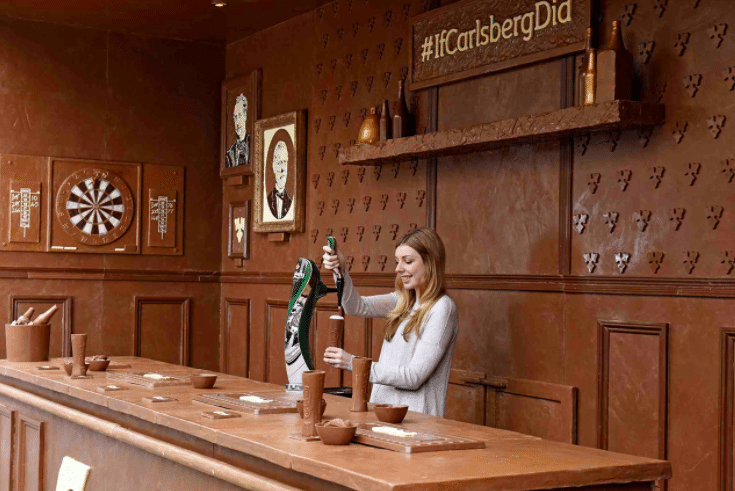 The brand created a giant beer bar out of chocolate and encouraged customers to enjoy a pint of Carlsberg out of chocolate glasses. As well as getting press attention for the stunt, images of the campaign went viral on social media. Of course, in some countries such as the UK, Easter weekend is a bank holiday weekend. The eggs-tra days are perfect for some extra housework, gardening or chores that don’t usually get done. So, where applicable, it’s worth focussing on this aspect of Easter as well. Limited time sales and offers can boost footfall to a store or website. Having a countdown clock displayed on your emails and website can increase the sense of urgency. It’s vital that you don’t leave your communications to the last minute when doing a bank holiday campaign. Otherwise, your messages may be lost in the many other marketing campaigns occurring at the same time. Timing is everything. Retailers who launched their bank holiday campaigns on the Thursday or Friday before the weekend experienced 26% more clicks and 17% more conversions than those who sent communications during the weekend. Easter isn’t an event solely for the religious or sweet-toothed. Every business can get involved. Indeed, a well planned Easter marketing campaign can put a smile on your customers’ faces, grow brand awareness and increase engagement and customer loyalty. But with many businesses jostling for a piece of the Easter egg, your campaign has to stand out. Plan well ahead and make sure your customers know what’s happening beforehand. Time is fast running out, so you better hop to it.